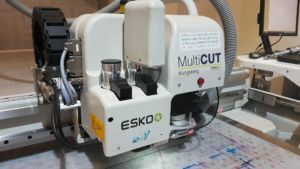 Digital die cutting offers unmatched digital finishing performance and versatility. The 60″ x 120″ cutting surface allows us to cut virtually any substrate. Using your vector files or clipping paths, we can contour cut, score, engrave, kiss-cut and route on any material. Your short-run signage, P.O.P., packaging, tabletop displays, standees and decals are now affordable and available in quantities of 1-1000 without a die. The possibilities are endless.